Just a week after issuing a recall on their gluten-free chicken nuggets, Perdue Foods has recalled another chicken nugget product. 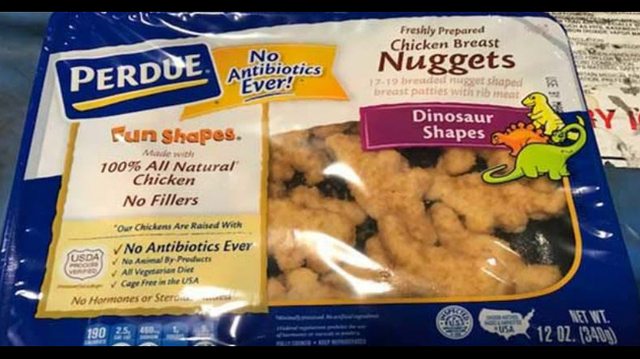 All 12-ounce packages of Perdue's Fun Shapes Chicken Breast Nuggets (ready-to-eat) with a use-by date of March 11, 2019, and lot codes 1700910 – 19009010, have been recalled. The United States Department of Agriculture (USDA) reports that the product was mislabeled after production on January 10. Though the product contains milk (a known allergen), that ingredient does not appear on the label. Recalled products (16,011 pounds worth) were sold in D.C., Maryland, Virginia, West Virginia, Connecticut, Delaware, Maine, Massachusetts, New Jersey, New York, Ohio, Pennsylvania, Rhode Island, and Vermont. There have been no reports of illness thus far. Contact Perdue Consumer Care at 1-866-866-3703 if you are in possession of any of the recalled chicken nuggets. Have you been affected by any of the recent recalls? Tell us in the comments!